Remember that feeling of sinking into your favorite chair with ease, and passing the hours with your favorite TV show or a good book? That’s the feeling re-created by power lift recliners, which can gently guide you from a standing position to a fully seated position effortlessly. From there, you can even relax further and slip into a fully reclined position. That’s the difference between our power recliner lift models and standard recliners. With power lift recliners, sitting and standing is no longer a chore. In fact, with one of our recliners it takes no effort at all to get in and out of the recliner. Once seated, you can find the position that’s perfect for you with powered back and leg rests that can be adjusted to suit any position. If you have limited mobility, and getting in and out of your favorite chair has become more of a chore than an enjoyment, then there’s no substitute for power lift recliners. The best recliners, and the only recliners we carry, are made right here in the inside United States. 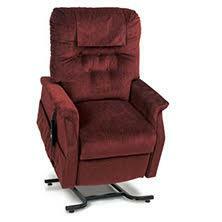 Williams Lifts exclusively carries the Golden Technologies brand of power lift recliners. If you’re wondering why we only carry one brand, here’s some information about what makes Golden Technologies the ‘gold standard’ in recliners. Golden Technologies offers six series of power lift chairs, and within those series there are dozens of models to choose from. That means we couldn’t possibly recommend a specific model without having you come in to try some for yourself. After looking at our showroom we’re confident you’ll find the perfect combination of size, weight capacity, options, and accessories to suit your needs. Golden Technologies not only provides the peace of mind of knowing you have safety in your home, but you have peace of mind knowing you got the best possible product available. Each recliner that is made by Golden Technologies is made with the finest materials, using the most advanced technology. Every one of their chairs is made with the utmost attention to detail and stands up against our rigorous quality control. That’s why Golden Technologies is our number one choice and the leader in our industry. When you buy a Golden Technologies chair you know you’re getting a product that’s handcrafted and American made in a state-of-the-art facility. Golden Technologies power lift chairs are backed by the industries’ best warranty, and provide the smoothest, quietest, and most secure lifting system. Regain independence of slipping back into your favorite chair with one of our Golden Technology power lift recliners today. If you’re ready to buy or rent please do not hesitate to get in touch. A contact form is conveniently located on the right side of this page for you to fill out, and once you hit the submit button a representative will get back to you shortly. Rent or buy one of our power recliners and stop making sitting comfortably an obstacle in your life.